“This disaster is expected to be catastrophic for the land and people in the gulf,” he writes. “Of equal concern, though, are reports that BP and other oil companies are pressuring our Canadian regulator, the National Energy Board, to drop a requirement stipulating that companies operating in the Arctic must drill relief wells in the same season as the primary well,” he adds. “Environmental protection and conservation is in the public interest and so we ask that the federal government not compromise our fragile Arctic ecosystem to attract environmentally destructive industry,” Clancy writes. “We would hope that regulations are, in fact, strengthened for oil and gas exploration in the Arctic. At a minimum, we ask that no exemptions from regulations be awarded to BP or any oil and gas company looking to do business in Arctic waters,” he says. 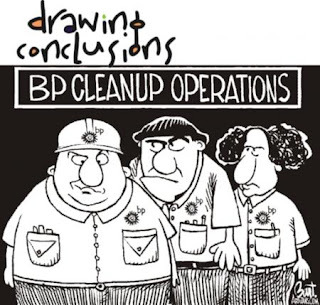 Clancy notes that BP “more than doubled” its first quarter profits for 2010 to $5.65 billion. He also says NUPGE, as an advocate of “strong regulations” in the public interest, has been pleased “to hear that the federal government, as well as a number of provincial governments, are reviewing offshore-drilling regulations” as a result of the Gulf disaster. This entry was posted in Arctic and tagged Labour. Bookmark the permalink.